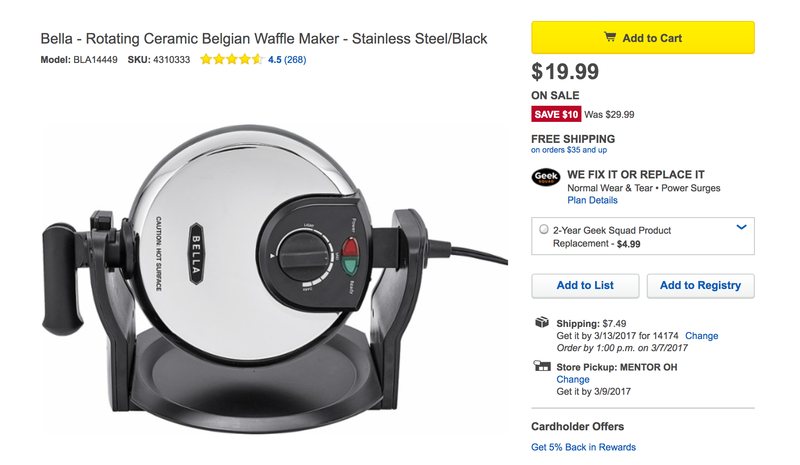 Today only, as part of its Deals of the Day, Best Buy is offering the Bella Rotating Ceramic Belgian Waffle Maker in stainless steel/black (BLA14449) for $19.99 with free store pickup or free shipping in orders over $35. Also available via the official Best Buy eBay store. That’s 33% below the regular $30 price tag and the best we can find. Rated 4+ stars from over 250 Best Buy customers. Variable control dial allows you to select a preferred level of browning. Rotating function allows you to flip the waffle while cooking to ensure even, flavorful results. PTFE- and PFOA-free nonstick ceramic coating enables easy food release and simplifies cleanup. Drip tray collects spills and crumbs to minimize mess. Space-saving design and folding handle help minimize occupied space when not in use. Bella Ceramic Rotating Belgian Waffle Maker: Prepare a tasty breakfast with this waffle maker’s rotating function that lets you flip the waffles for even cooking. The nonstick ceramic coating allows you to easily remove the waffles when they’re ready.